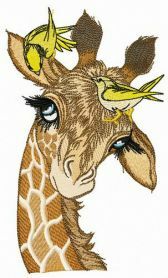 Funny, positive, amazing, unique – that’s what each giraffe is! 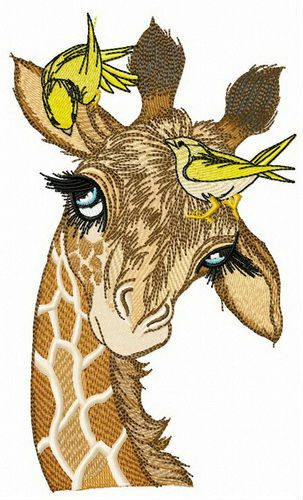 If you’re looking for an original machine embroidery design with a giraffe, you’ve come to the right place. 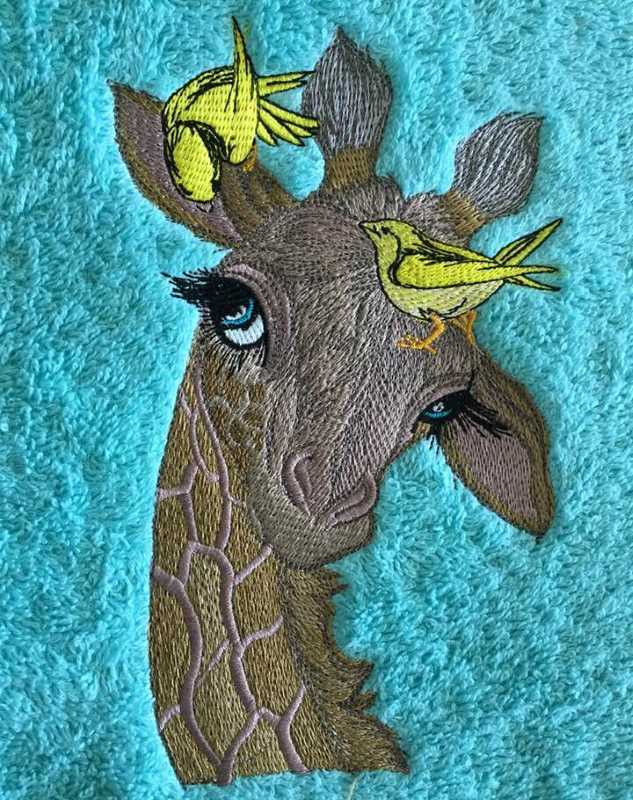 Take a look at this particular one which features a cute blue-eyed giraffe. Two yellow birdies have landed on its head. The needlework comes in a color palette of wicker, tan, ivory, ashley gold, lemon, blue frost and sand dune among others. The level of detail is amazing! 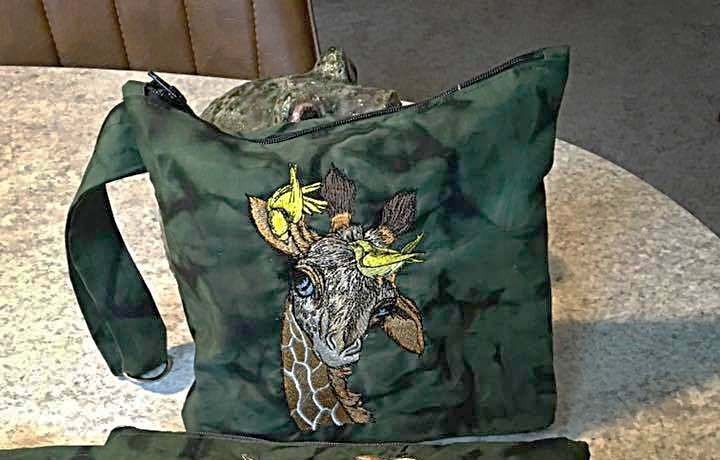 You can stitch out this application to your favorite stuff such as jackets, T-shirts, pajamas, purses, shopping bags, towels, cushions, napkins, blankets, etc. I would like the giraffe with a background, too. Hope this is the right place. Thank you. No problem, format and size please. Via Contact us form. 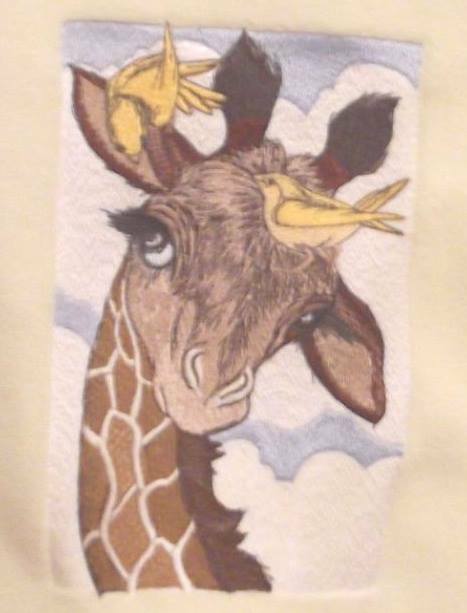 I am making a baby quilt and I am making the giraffe the center of the quilt could I please get the giraffe with the back ground. 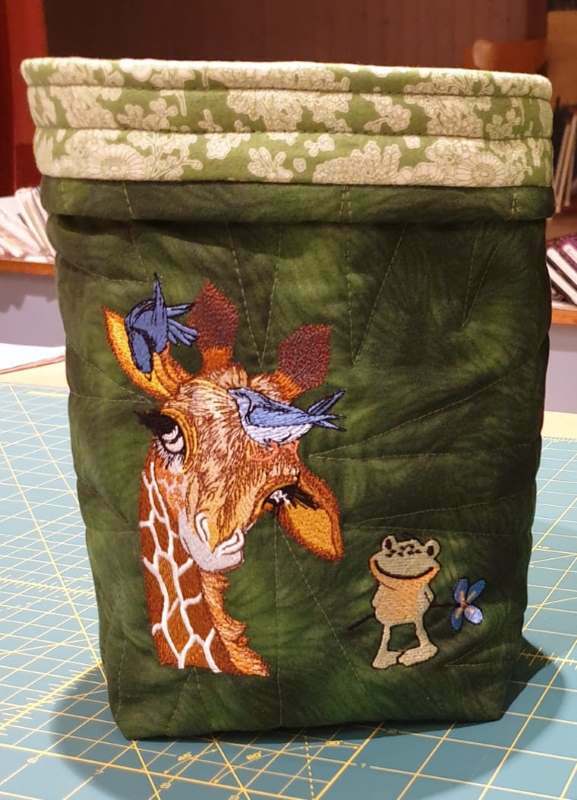 I've used the giraffe design to decorate my shopping tissue bag. Stitched out very nice. I'm pleased with the purchase. Good price and supporting if needed. Would exactly buy here again. Great giraffe for my project! Sewed out very neat, LOVE IT! Fast download and great price. Worked with Brother 535 machine, digitized wonderfully. I recommend. 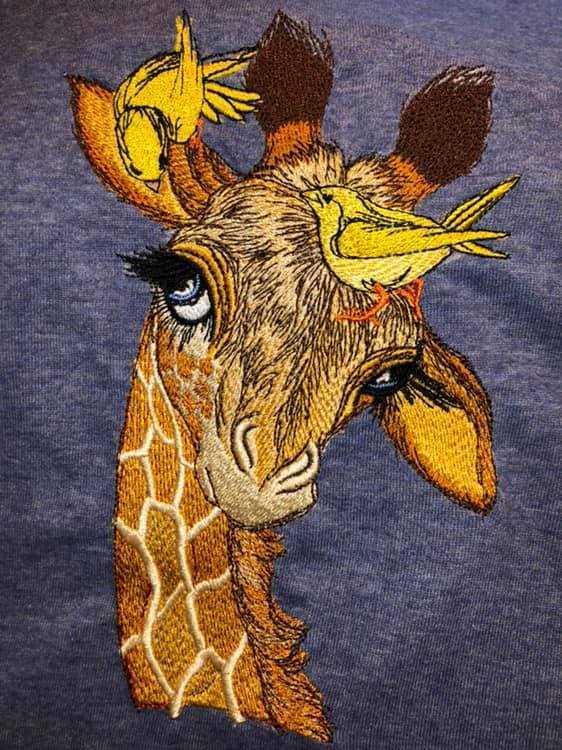 I just purchased this design--very cute---could this giraffe be done without the birds on the head. I think I bought all the sizes but if I need to choose, I want the biggest one. I use vp3 or vp4 for my Epic. We will help you. Please specify exact size in inches or millimeters. Thank you for sending the corrected files, they downloaded and imported perfectly, I'll be trying a stitch out a little later this evening. Thank you kindly for your quick response I really appreciate it very much. Please attach picture in our custom digitizing service. Perfect and cute giraffe! Stitched out great! Highly recommend this shop! Will definitely shop again with this seller. love the design! Thank you!